I have to start my first review with my all-time favorite mac and cheese artisans, the geniuses at Homeroom. 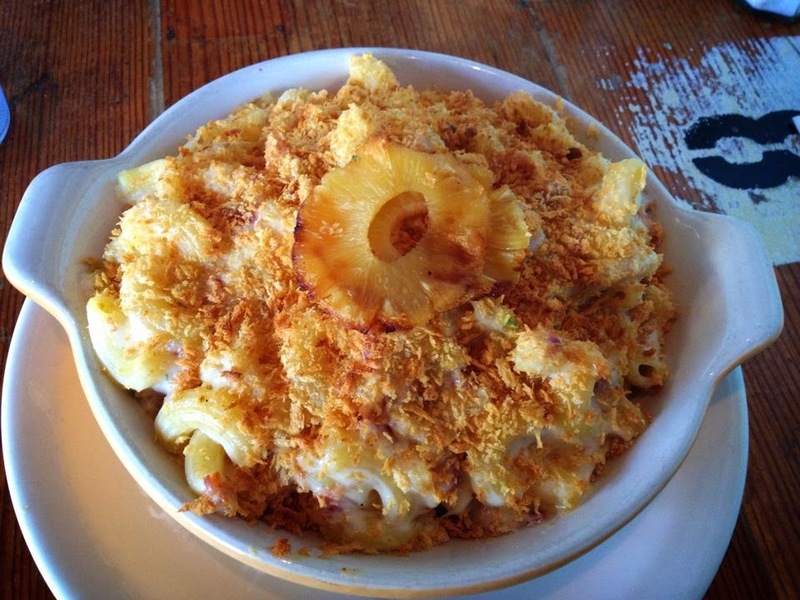 Located in Oakland, this mac and cheese specialty restaurant has been a local favorite since it's opening in 2011. Generally, you'll find yourself waiting for at least twenty minutes for a two person table on any given evening of the week. It's worth the wait, however, as you'll eventually find yourself holding a menu full of some of the most unique and delicious mac and cheese recipes ever concocted. From their Classic all-cheddar mac to their popular Gilroy Garlic mac to their decadent Ivy Leaguer: Truffle Mac, there's a style of mac and cheese for everyone, even vegans. Not a fan of gluten? The folks at Homeroom have you covered with gluten-free options for a majority of their menu items. They also offer the option to build and customize your own dish with different toppings and add-ons including breadcrumbs, bacon, hot dogs, tuna, sautéed mushrooms, dungeness crab and even potato chips. My first experience here was a lunch with my co-workers. I ordered the Vermont White Cheddar with bacon and breadcrumbs, and have been a Homeroom devotee ever since. I frequent the restaurant with the same excitement and anticipation as a kid waiting for Christmas presents. Come to think of it, if someone gifted me with Homeroom for Christmas, I'd probably pass out from sheer joy. The chefs at Homeroom have really nailed the art of the béchamel sauce, the base sauce that blends with and makes the melted cheese so creamy and filling. Overall, their mac and cheese can be best described as rich and creamy with distinct flavors for every dish. I've always been surprised by how well the flavors stand out in each of their dishes. The Smokey Bacon Mac is one of my favorites when I'm in the mood for a strong flavor. I was initially cautious about the Gilroy Garlic Mac since I had never personally had garlic in my macaroni before, but after trying it, I've now become a fan of trying garlic in all sorts of recipes, not just mac and cheese. In fact, the first time I ever made a homemade mac and cheese, it was following Homeroom's recipe for the Gilroy Garlic Mac. The only dish I've had that I was slightly disappointed with (and I mean slightly) was one of their recent monthly specials: the Hawaiian Mac. It boasted Havarti cheese, bacon, scallions, and roasted pineapple. Since the draw of the dish was the "Hawaiian" flavor, I expected a bit more from the roasted pineapple. They had the chunks cut so small that when they were roasted, they seemed to lose most of their juice. I'd bite down into a forkful and where I would be expecting soft pasta, I found crunchy resistance. This would have okay if there had been more pineapple flavor, but since it seemed like most of it was lost, my brain was left with a kind of flavor/texture disconnect. However, the Havarti cheese sauce was superb and I still finished my entire plate. So, like I said before, I was only slightly disappointed. If you need a little green with your mac, they've got several salad and veggie options. My personal favorite is the Roasted Brussels Sprouts (with bacon of course). And, if you can stomach it after all that pasta, they've got some killer desserts. Their house specialty are the homemade oreos, which have more of a whoopie pie feel and are definitely big enough to share if you just want a little sweetness at the end of your meal. The atmosphere of the restaurant is especially fun. They've taken the restaurant name to heart by using old school benches for tables and entries from an old library card catalog for customer loyalty cards. If I were to use a ratings scale, I would have to give Homeroom a five out of five. Every one of their dishes is spectacular with consistent quality and taste. While I've found a few mac dishes at other restaurants to rival theirs, you can't argue with the sheer volume of choices they have, every one of them excellent and, if you're smart, topped with breadcrumbs.